A winning combination of superior sound quality, convenient mixing control, and reliability has made the Yamaha EMX Series the top choice for bands, personal studios, houses of worship, corporate and educational facilities. Compact packages, versatile input capabilities, plentiful power and top-quality, built-in signal processing are standard equipment. 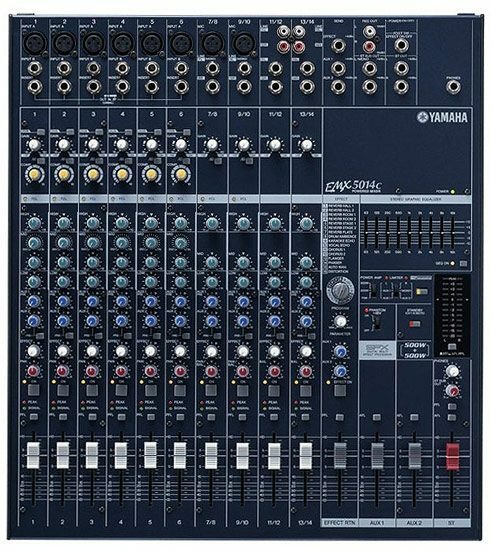 Like others in the EMX family, the EMX5014C is a fully integrated mixer offering a range of features to mix, process, and deliver your sound with maximum quality and creative control. Equipped with ultra-lightweight amplifier circuits, power is the priority of the 500-watt per channel multi-mode stereo power section. For sound shaping and feedback control, the EMX5014C includes 3-band EQ on each input channel, a stereo 9-band graphic EQ on the main stereo output, and a separate graphic for the monitor output. Each channel also contains a Feedback Channel Locator (FCL) indicator that pinpoints the input channel creating the problem. Additionally, channels 1 thru 6 provide single knob compressors. This Yamaha exclusive feature is great for controlling unruly vocals or tightening up a bass guitar. Overall: I have been playing Drums for over 50 yrs but a novice on the sound board learning fast I love it so far, sounds good, lots of power for live sound.very easy to carry round.